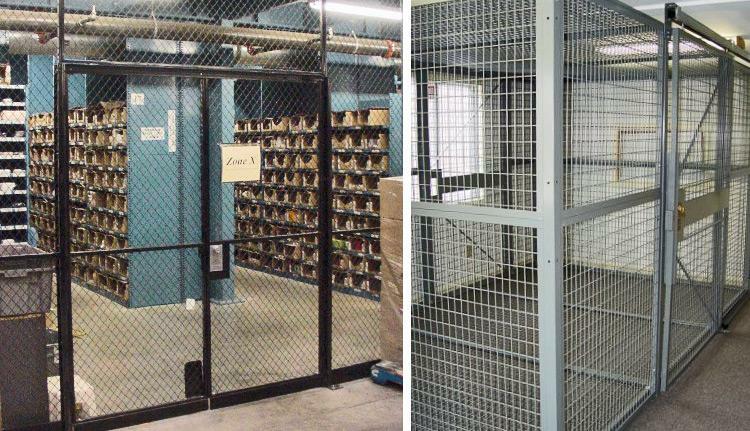 Wire partitions from FSS can be used as evidence storage cages, weapon storage cages, and controlled substance enclosures. To properly secure and protect the sensitive or dangerous items, our security and storage enclosures can be designed without sweep space beneath the panels. Likewise, heavy-duty magnetic locks and electronic strikes are available for making doors secure from those without proper permission. All wire partitions and storage enclosures from FSS come with a lasting polyester powder coat finish. Option for hot-dip galvanized material is also available upon request. Whenever there is a need for secured storage, there is a need for storage enclosures from FSS.